Dorothy's Cardinal Feeder is perfect for songbirds. This feeder features a large 15" dome that serves to protect the feeder tray from squirrels, undesirable birds, and the elements. The unique versatility of this feeder allows you to limit the access of undesirable squirrels and birds by adjusting the distance between the dome and feeder tray. Move the dome closer to the dish and the feeder becomes songbird selective. The 13" diameter feeder tray is 1" deep and will accommodate a virtually endless variety of bird foods including 0.75 quarts of seed, suet, and table scraps. Simply slide the feeder dome up the included hanging rod or unscrew the feeder tray for quick and easy cleaning and filling. 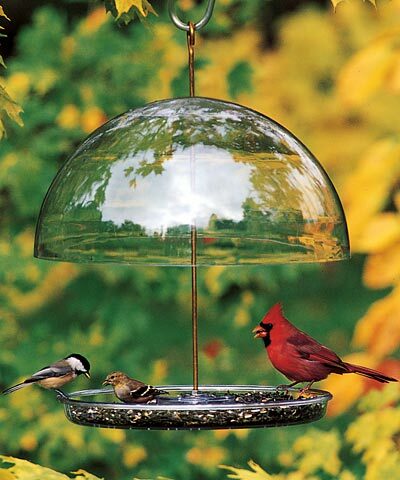 The feeder dome and tray are clear plastic to keep the birds and the seed level visible at all times. This feeder may be hung with the included 10.75" solid brass hanging rod or post mounted using any pole with a 0.75" threaded adapter (not included). Made in the USA. Lifetime Guarantee. Note: If pole mounting this feeder, you may need to purchase a pole mounted squirrel baffle to protect the feeder from squirrels. Capacity: 0.75 qts., 1.125 lbs. Droll Yankees Garden Pole, Black, 5' 8" x 1" O.D.